Beware of dealing with Jenny Forst (jennydodi). My kitten, Treasure Trove was finally returned to me by Jenny Forst after I met her demands for another kitten in return for getting him back. I give below the bizarre situation of his “disappearance” and miraculous “re-appearance”, which is beyond belief. Treasure was last seen in my house at 6:00 p.m. on September 26th, 2011. We had two sisters visiting us from 2:00 p.m. until 6:15 p.m. that day. 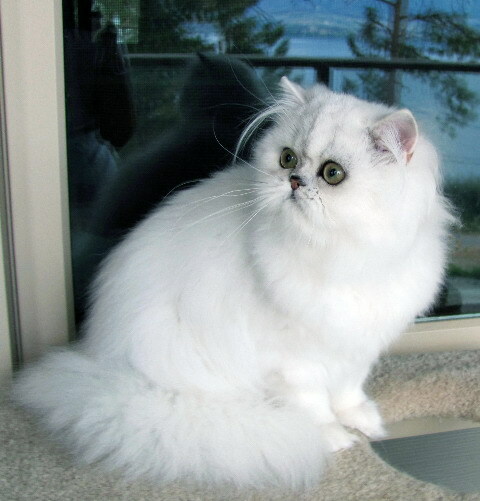 One of the sisters, Jenny Forst from Vancouver, had been e-mailing me for several weeks trying to persuade me to sell her my chinchilla silver female kitten. I had refused since this female had valuable breeding lines. When Jenny came to Kelowna she phoned me and asked if she could come to my house to see my cats even though I had told her I had nothing to sell to her. About an hour after she arrived she asked if her sister, who lives in Kelowna, could also come to my house, which she did. Jenny was staying with her sister for a week at the time she visited me. She had not brought a carrier with her since I had written to her and told her that I would not sell her the female kitten, Jubilee, that she wanted to buy. When she saw Jubilee she beseeched me to sell her. She said she would pay me $2,500 if I agreed to let her buy her. Her sister also pushed me into selling her by saying Jenny would give her a wonderful home. I eventually gave in but said that even if the kitten was worth $2,500 to me because of her pedigree, it would not make sense for Jenny to pay this much for a kitten that was sold as a pet. I agreed to sell her the kitten as a pet on condition that she also took a companion kitten for her at no cost.. The total price for the two kittens if not separated would be $2,000. I made it clear that for the purpose of the contracts and guarantees I would write the cost of Jubilee as $1,500 and the Exotic kitten as $500. She asked if her sister could buy the Exotic for $500 and I refused. The deal was that the two kittens must stay together as companions for each other. When the time came to put the kittens in the carrier, her sister unlatched the carrier door for me. She had to kneel on the floor in her work clothes and high heel shoes in order to do this. I have arthritis in my fingers and the latch was difficult for me to open and this is why I asked for help. I put the silver female into the carrier and Jenny put in the Exotic male. The door was immediately latched closed. It was impossible for any other kitten to get into the carrier without Jenny, her sister,my husband and myself noticing. The carrier with the latch well secured was left on the living room floor with the 2 kittens locked inside and my husband and Jenny’s sister stayed in the room while Jenny and I went downstairs to print the contracts. While I was getting them ready Jenny said she would have to go to her van to get her handbag to pay me. She returned about 10 minutes later and we signed the contracts and she wrote me a cheque for $2,000 in full payment for the two kittens. She was getting very agitated and complained that my laser printer was too slow. She made me immediately sign the contracts and even before I could finish stapling her copies together she left me downstairs to put off my computer and photocopier and raced upstairs. When I arrived upstairs soon afterwards I discovered that everybody had gone out of the house. It turned out that my husband and Jenny’s sister had gone out while we were downstairs copying the contracts. Jenny had also walked out of the front door with the carrier containing the kittens before I came up. Treasure Trove had been sitting on the scratching post in the living room when we went downstairs and he was not there when I came upstairs. It was now time to feed the cats and I searched everywhere for him but he could not be found. This is when I realized that he had been taken by Jenny. I phoned Jenny several times but she refused to answer her phone so I left several messages on her voice mail asking her to search her room as I was sure Treasure was not in my house. Rather than accuse her of deliberately taking him I suggested he could have somehow got into the carrier “by mistake”. Of course I knew that this was impossible but I was trying to give Jenny an excuse for “finding” and returning him. I also told her that he was on medications since he had problems because he had been delivered by c-section and his head had been stuck in the birth canal. He was not on any medications and was a healthy little boy. I said all this in the hope that Jenny would be frightened into “finding” and returning him. I had to leave for Vancouver the next morning to meet a friend who was flying in from Pennsylvania with a kitten for me. Before leaving Kelowna my husband and I stopped at the Toronto Dominion Bank to cash the cheque given to me by Jenny. Realizing that she had stolen my kitten I was worried that she might stop payment on her cheque. I was correct in my assumption. As we arrived at the bank I met Jenny coming out. She asked why I had not left for Vancouver and I told her I had decided to cash her cheque before leaving. She said I would not be able to cash her cheque. I asked her why and whether she had stopped payment on it. She admitted she had because she no longer wanted the Exotic kitten. I asked her to accompany me back into the bank as I required her to pay me the $2,000 in cash right away. She made a fuss about having paid $17.00 to put a Stop Payment on the cheque but persuaded the teller not to charge her for this. Once I received the cash I told her to take me to the house where she was staying with her sister and I would return the full amount of $2,000 for both the kittens and take them back. It was my hope that I would see my missing golden kitten in the room where she kept the kittens. She refused to take the money back and insisted on keeping the chinchilla silver female. We returned from Vancouver on September 28th evening and went straight to the RCMP office and filed a Report on my stolen kitten. Constable Boffy reassured me that if Jenny had decided to return one of the kittens when the sale was for 2 kittens together she was not entitled to receive any money back. She told me they would search Jenny’s sister’s house for the missing kitten. They did this the next day and informed me that Jenny had been very accommodating and allowed them to search the house but told them she had not taken the kitten. They were not able to find it. On September 29th afternoon I received a phone call from Jenny. She said that if she searched the house and found Treasure Trove, would I give her the silver kitten that I had reserved for somebody else. Initially I said it would not be right to do this as I had a deposit on the silver kitten. Jenny then said she would not search for my kitten. 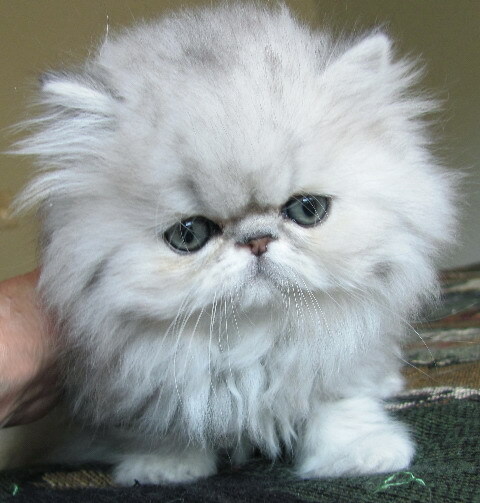 Wanting desperately to get my kitten back I agreed to let her have the Shaded silver Persian male kitten if she “found” Treasure. About 15 minutes later she phoned me and told me “Guess what? Guess What? I found him!”. She said she would give him back to me if I gave her the Silver male kitten. I had no choice but to agree. She then asked if I would give her the $2,000 reward I had offered for information leading to the return of the kitten. I told her I would not give her the reward since the kitten had not been lost from my house but had been taken by her to her sister’s house and she had known about his whereabouts the whole time. When she purchased the two kittens I had given her a container of soft raw food that I made for my cats and this is the only food that Treasure would eat. By the third day the food had been finished and Treasure would have died of starvation if Jenny had not returned him to me. She insisted that I meet her and her sister at Tim Horton’s on Lakeshore Road in Kelowna in half an hour. I was to bring the Silver kitten for her if I wanted Treasure back. I told her I would be there in 45 minutes and asked my friend, Beth Ritland, to join us there as I needed a witness. 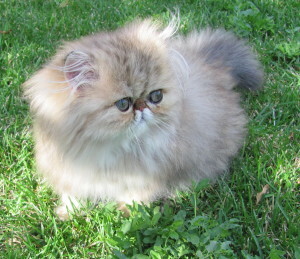 I also phoned the RCMP office and asked if Constable Boffy could be present to witness the return of the kitten that had been reported to the police as having been stolen. Unfortunately Constable Boffy was out on a call so was not able to be there. We met as planned, new documents were signed and Treasure was handed to me by Jenny’s sister only after my pet sitter had handed over the shaded silver male kitten to Jenny. This was like a scene from a hostage-taking movie. Addendum – Jenny’s sister has since admitted in writing that she saw the extra kitten in the carrier as soon as they returned home. She said she had tried to persuade Jenny to return Treasure to me but Jenny refused. It was not until THREE DAYS LATER that Jenny phoned me and said that she would search for him only if I would give her the silver male kitten that she demanded. I am still awaiting the original spay/neuter Certificates that I have requested to be sent to me by mail. These have not been sent in spite of numerous reminders. Once I receive these Certificates I will give Jenny pedigrees on her kittens as indicated in my contracts. The above account of the theft and return of my kitten can be verified as being the true and correct facts by Constable R. Boffy of the Kelowna Detachment of the Royal Canadian Mounted Police. RCMP File #: 2011-49023. Phone: 250-762-3300. The RCMP were involved from the beginning to the end of this incident. The above are photos of the two kittens sold to Jenny. The photo of Jubilee, the kitten on the left, was taken on September 25th, 2011, the day before she was sold to Jenny.